As a veteran director with extensive experience on 12 nonprofit boards I have been “treated” to a wide variety of on-boarding sessions for new directors. Having experienced board members sit next to new ones at meetings. Listening to the CEO review the entire policy manual. Use the book’s 150-item Index Strategically: Ask new directors to read specific topics (e.g., micromanaging; outcome vs. impact data; responsibilities of the board) and relate the readings to their new board. 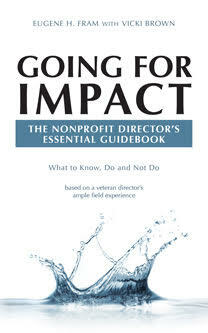 Select Key Chapters in the Book: Choices include topics such as Nonprofit Culture Presents Challenges or There’s a Boundary Line That Shouldn’t Be Crossed. Then later – in either formal or informal sessions – have the CEO and/or board panels discuss the topics with the new directors. Give All New Directors a Copy of the Book: Ask them to skim or read the book’s content, which encompasses 112 pages, and list topics of greatest interest. Then hold three or four informal on-boarding sessions, led by experienced directors that relate to the selected topics. Going for Impact can also be utilized by creative boards and CEOs to develop retreat agendas that can help enhance their board’s governance perspectives! ← Nonprofit Board And Internal Working Environments—No Pieces of Cake!